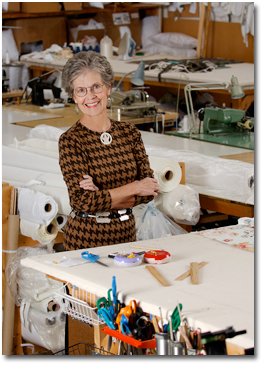 Sylvia Marvelli, owner and operator of Carolina Custom Draperies, established the business in 1976. We are located in Winston-Salem, NC, and serve designers primarily within the state. Our specialty is high-end custom residential and commercial jobs where quality is required. Carolina Custom Draperies is proud to have fine seamstresses that have been with the company for many years providing consistently high quality workmanship. Our company is capable of fabricating large projects yet small enough to personally attend to details and design specifications through careful communication with the designer. Work created by Carolina Custom Draperies has been featured in numerous magazines and on magazine covers. Our work has graced designer show houses as well as the Southern Living Idea House. Additionally, the best interior designers continue to provide us with challenges that expand our knowledge. Together we work to achieve a result that meets or exceeds a client’s expectations. It is our desire to be the finest fabric technicians to the finest interior designers. We genuinely appreciate the opportunity to serve and help you reach your goals. Your questions and comments are always welcome. You are the reason we are in business.